Major home appliances are not meant to last forever. Most major appliances have a planned obsolescence of 10 years. If a major appliance provides more than 10 years of service, a consumer has certainly gotten his money’s worth … or have they? Most would likely admit if the refrigerator is not broken, there is no need to fix it. Also, many homeowners will not consider replacing appliances until the kitchen needs remodeling or they are moving into a new house. Homeowners often will take the repair approach because the repair cost is less expensive than purchasing a replacement unit. The reality is as appliances age, their overall energy efficiency can drop significantly due to aging parts, malfunctioning controlling devices, bad seals and other components. For instance, a bad thermostat on a dryer will cause it to continue drying even when clothes are dry. A bad seal on the freezer or refrigerator will cause the unit to cycle frequently. Speaking of old refrigerators and freezers, many Americans keep one or more in the garage, which is an unconditioned air space. During warmer months, the unit cycles much longer in order to keep its contents cold. 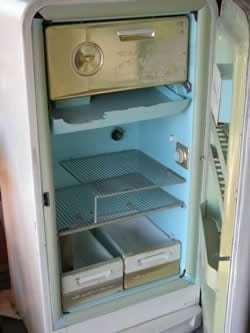 Older refrigerators equate to additional energy consumption. Running an additional older model unit can consume up to 66 percent more energy than a newer model that is ENERGY STAR® equivalent. Even though a consumer may have gotten their money’s worth out of an appliance, you may be spending far more on electricity than the unit is worth. For instance, it is not uncommon for older model refrigerators and freezers to average $1 per day to operate. It is not always obvious when an older appliance has become an energy waster. But it is a safe bet that if a major appliance is more than 10 years old, there is an ENERGY STAR® replacement available that can save money over the long haul. Today’s technology is a friend when it comes to energy efficient appliances. Older motor and controller technology is less efficient than today’s technology. For instance, programmability and energy saving functions are available on many appliances. Energy-efficient clothes dryers are available with humidity sensing controls that cause the dryer to shut down when clothes are actually dry. Energy-efficient washing machines have water saving features, motors, and a high-speed spin cycle that removes virtually all of the water from clothing. This allows for less drying time. For a complete list of energy saving appliances, visit www.energystar.gov and click on “Appliances” in the menu. Learn how to choose the right refrigerator.